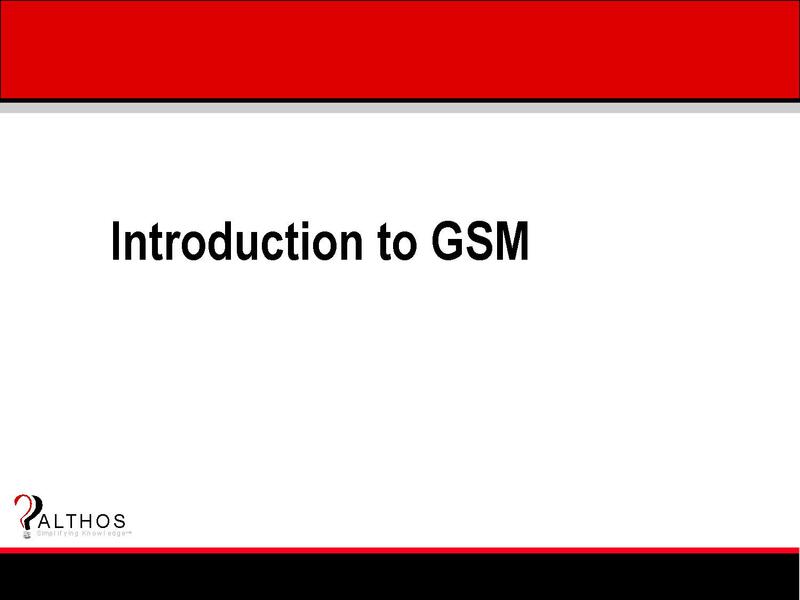 Introduction to GSM, 2nd ed. This tutorial explains the basic components, technologies used, and operation of Global System for Mobile Communication - GSM - systems. You will discover why mobile telephone service providers have upgraded from 1st generation analog systems to more efficient and feature rich 2nd generation GSM systems. You will also discover how 2nd generation systems are gradually evolving into 3rd generation broadband multimedia systems. This tutorial starts with the system components and basic services that the GSM system can provide. You will learn that the key types of GSM devices include single mode and dual mode mobile telephones, wireless PCMCIA cards, embedded radio modules, and external radio modems. You will then discover the different types of available services such as multiple types of voice services, data services, group call, and messaging services. Explained are the physical and logical radio channel structures of the GSM system along with the basic frame and slot structures. Described are the fundamental capabilities and operation of the GSM radio channel including channel coding, modulation types, speech coding, RF power control, and mobile assisted handover. You will learn how each GSM radio channel has 8 time slots per frame and that some of these are used for signaling (control channels) and others are used for user traffic (voice and data). Because the needs of voice and data communication are different, you will discover that the GSM system essentially separates circuit switched (primarily voice) and packet switched (primarily data) services. Described are key functional sections of a GSM network components and how they communicate with each other. You will learn how and why GSM is evolving into 3rd generation broadband systems including GPRS, EDGE, and WCDMA. This book explains the basic components, technologies used, and operation of GSM systems. You will discover why mobile telephone service providers have upgraded from 1st generation analog systems to more efficient and feature rich 2nd generation GSM systems. You will also discover how 2nd generation systems are gradually evolving into 3rd generation broadband multimedia systems.